Color/Appearance: Pink Ivory ranges in color from a pale brownish pink, to a bright, almost neon pink, to a deep red. Typically the most valuable pieces of Pink Ivory are a vibrant pink. 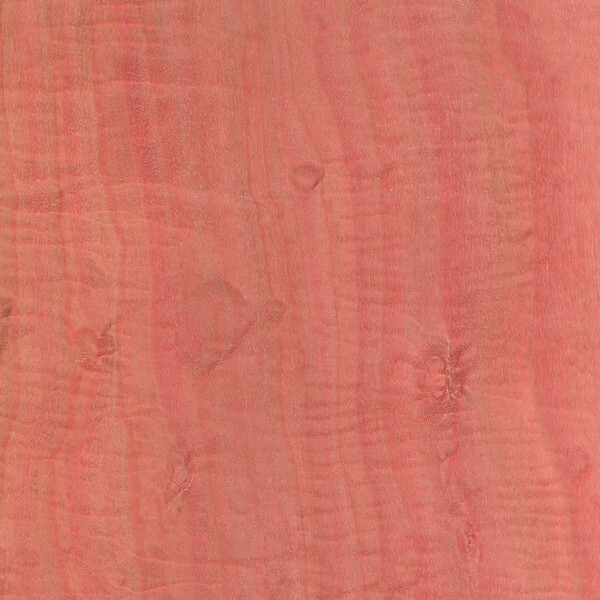 Pink Ivory can commonly be seen with a curly or fiddleback grain pattern, further enhancing its visual impact. 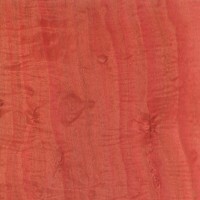 Sapwood of Pink Ivory tends to be pale yellow to light brown, with a somewhat gradual demarcation from heartwood. Color changes in Pink Ivory (becoming faded or dull over time) can be problematic and are not fully understood. 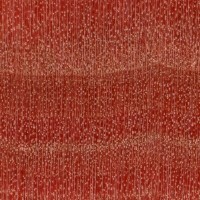 Grain/Texture: Grain is straight to interlocked; fine, even texture with good natural luster. 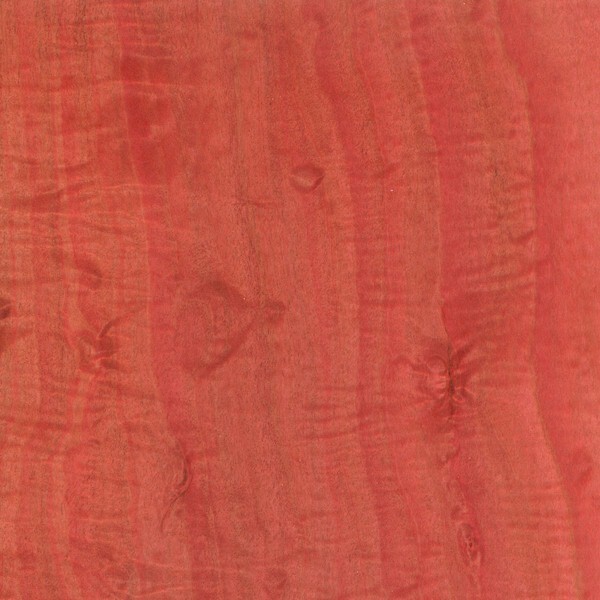 Endgrain: Diffuse-porous; medium pores in no specific arrangement, nuymerous; commonly in radial multiples of 2-4; gum/heartwood deposits common, though not easily seen with lens; growth rings may be distinct due to increased pore frequency in earlywood; narrow to medium rays visible without lens; parenchyma not visible with lens. Rot Resistance: Rated as durable to very durable regarding decay resistance, Pink Ivory is said to have excellent weathering characteristics: though it is seldom used in applications where this would be an issue. Workability: Pink Ivory has a pronounced blunting effect on cutting edges, and it’s fairly difficult to work in board form. Tearout can occur on figured or quartersawn sections during planing. 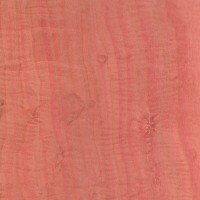 Pink Ivory is much more common in applications involving carving or turning, and it turns and finishes well. Odor: Pink Ivory has a distinct and somewhat unpleasant odor when being worked. Allergies/Toxicity: Besides the standard health risks associated with any type of wood dust, no further health reactions have been associated with Pink Ivory. See the articles Wood Allergies and Toxicity and Wood Dust Safety for more information. Pricing/Availability: Reputed to be a scarce commodity, Pink Ivory is typically very expensive, usually on par with Gaboon Ebony: another pricey African import. Common Uses: Carving, veneers, inlay, knife handles, billiard cues, chessmen, and other turned objects. Comments: Pink Ivory trees are said to be both rare and valuable, and have been rumored to be “rarer than diamonds.” Other reports state that the tree is relatively common in some areas of South Africa—though large trees with straight, defect-free trunks are much more scarce. According to folklore, the tree is considered sacred to the Zulus in South Africa and is reserved for royalty. 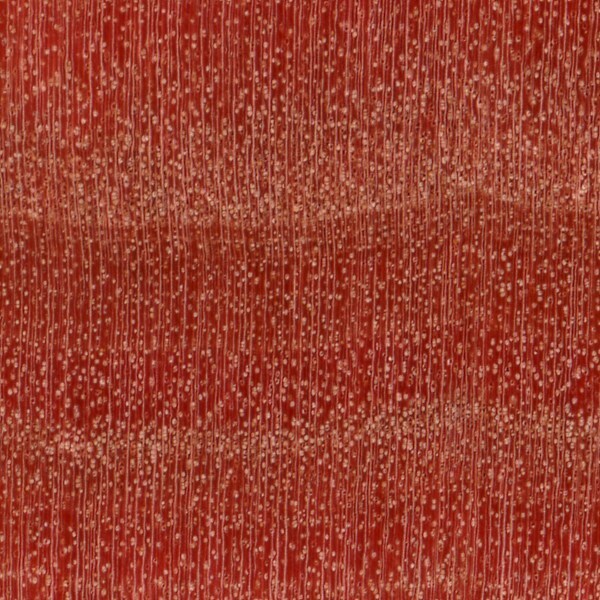 Scans/Pictures: The bright pink/red colors shown below represent what is usually the most sought-after hues of Pink Ivory. Also, you’ll see some Pink Ivory that has been turned into an ice cream scoop handle, and has been used in the Neapolitan pattern consisting of Black Walnut (chocolate), Hard Maple (vanilla), and Pink Ivory (strawberry). Really???!!! Is it true this wood species is not listed in the CITES Appendices or on the IUCN Red List of Threatened Species? I need to confirm this formation please. It’s true. However, I should clarify that there’s a difference between IUCN evaluating a species and determining it is “least concern” and simply not evaluating a species. It may be that pink ivory is too obscure of a species to focus much attention on, so it has simply not investigated it yet. Also, CITES determines international trading, particularly with source countries that may have a problem with compliance and enforcement. It may be that South Africa is doing their own enforcement and preservation of the species. I have made a beautiful large coffee table, mirror and TV cupboard from a red ivory tree stamp dropped by someone in my yard because it was in their way. Had the stump cut up in planks. Definitely a wood worthy of being called a royal wood, more beautiful than polished iron wood and rivals tamboti. I am having limited success growing Berchemia zeyheri from seed in Southern Arizona. 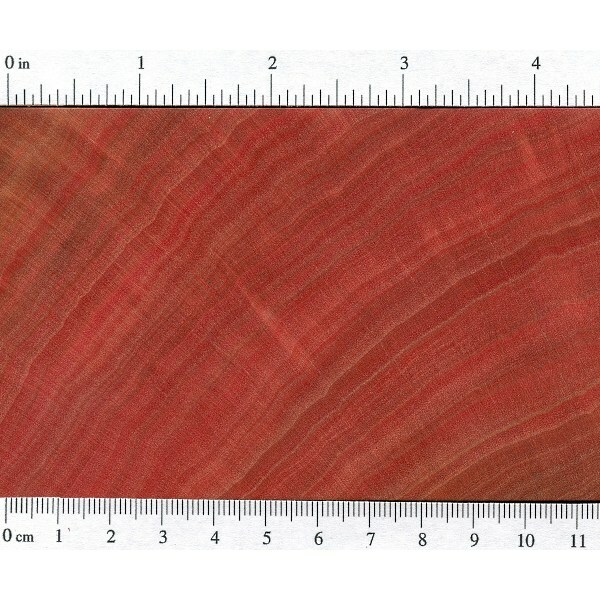 At 5 years old, the bottom 6 inches is only as thick as a broom handle, and will only be sapwood for about 20 years. At 4 years, it produced its first flowers and viable seeds. It does not like frost, but will probably stand the desert winters once it is old enough to have thick bark. Ground squirrels gnaw the bark off saplings..I have been keeping them potted, and bringing indoors through the winters. It keeps its leaves over the winter indoors.. Thank you for your information, I find it very interesting. Can you explain a bit more what does frost make to these trees? Hello Robert: I tried for years to get Berchemia zeyheri to germinate, using different “drastic” methods which included even using petri dishes with the hard shells carved down to reveal the embryos. However, I did get them to begin to germinate, but they died before really sprouting. I have a friend who lives in Thailand, and he tends to be almost negligent and reckless in the way in which he approaches things. So, I sent him some of B.zeyheri and B.discolor seeds (Which I have never been able to get to germinate.). So, upon arrival at his home in Thailand (while I sort of laughed to myself), he just filled some buckets with some, very clayish soil with very little topsoil, and more or less just threw seeds down and covered them with about 1/2″ of soil. Within 2-3 weeks, almost all of them had sprouted and continued to grow. He did nothing special except to tie them to bamboo canes to hold them upright. Two years later the tallest of all of them (B. zeyheri) is about 5 feet with a stem on it only about 3/8″ in diameter! Another B. zeyheri had its stem get broken off almost at soil line and it responded to this by growing vigorously to about a foot in height with a flurry of leaves and side branches. The B. discolor plants initially seemed more vigorous than the B. zeyheri but then throw out more side-branches and leaves than the B. zeyheri. Also, the B. discolor has significantly prettier, larger, but very similar leaves to the B. zeyheri After seeing that my friend was able to doe this, I am encouraged to try it again. (Here in Portland, Oregon.) I have ways of creating a better environment, more like Thailand, than is usual here in Portland. Thailand is known to be a biological hotspot in terms of how well things grow there, and in diversity of plant-life. Olá Bob, moro no Estado de Rondônia, Brasil. Há três anos e meio adquiri uma muda da berchemia zeheri de um site chamado Planta Mundo . Meu interesse é variar o pomar. Pelo q li a frutinha é gostosa. Poderia me descrever o sabor da frutinha? A minha está com cerca de 2metros de altura. Can I have some seeds of Berchemia zeheri ? Would you like to trade or exchange some seeds from South East Asia. Made a comb out of this wood recently. Sanded the surface up to 2000 grit, the surface feels like glass, and looks fantastic even without a finishing coat. Definitely tricky to cut thin slices of this wood without getting a “tear-out” as mentioned. I broke a tooth on the comb but super glue fixed this seamlessly -probably because the wood is very dense and hard. Love working with Pink Ivory, just made a pen/stylus combo for my daughter about 2 hours ago. So far I have only turned Pink Ivory so I have no experience in working with it other than turning. 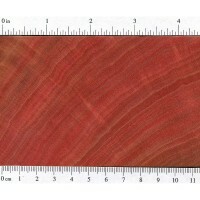 Given the dimensions Pink Ivory is generally available in, inlays, turning or carving is about all it is suitable for. I not only like the look of Pink Ivory, it has a really good feel to it when it’s nicely polished up. Just turned some Pink Ivory on the lathe. Turns beautifully; tight, dense grain that polishes well. The shavings and spindle were the color bubble gum, pencil eraser or Pepto-Bismol. Toxicity should be minimal, as the color is derived from tannin. The density should help it from charring thru like softer woods, but you might have to be clever and line it with a briarwood dowel, bored out. It’s probably not as harmful as what’s being smoked, should be ok. If you want to see a masterpiece, do a search on Amazon for Dennis Capplinger’s Gospel Banjo book. The banjo on the cover has a solid pink ivory wood neck, and the resonator is maple with pink ivory veneer on top. Quite striking. The neck wood came from Eisenbrand Exotic Hardwoods back when Art was in charge; the veneer was from Certainly Wood. It sounds as awesome as it looks.